The Chicago Blackhawks took a bit of a shot in the dark when they made Dylan Strome the key return in the Nick Schmaltz trade, but it's starting to look like he could have a long-term impact. 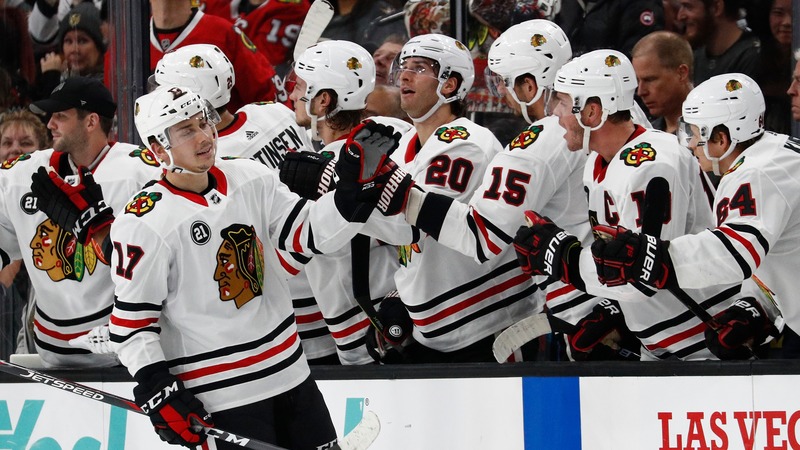 When the Chicago Blackhawks made the move to send Nick Schmaltz to the Arizona Coyotes in exchange for Dylan Strome and Brendan Perlini, the hope was always that [a fresh start](https://www.betchicago.com/nick-schmaltz-trade-blackhawks-signals-something) might rejuvenate three talented former first-round picks' careers. However, both sides took on risk and everybody involved was well aware of it. It will still be years until we can look at this trade in its totality and reach any sort of conclusions about who won, who lost or whether it all worked out for everybody in the end. But 20 games after the trade, the most pleasant surprise thus far has been Strome. __Play to win:__ [Enter our free contests for great prize packs and even cash! ](https://betchicago.chalkline.com/) The former No. 3 overall pick in the 2015 NHL Draft has been a source of contention among the relatively small NHL scouting community since he was in juniors. The 6-foot-3 center has incredible hockey sense with great hands and an elite shot that many thought gave him the potential to be a top-line center in the NHL. Unfortunately, his skating has always been an issue. So much so that other scouts thought it might keep him from being a top-six forward at all. Even at just 21 years of age, it was enough of an issue that the Coyotes were willing to take their chances on Schmaltz rather than weather the storm. Strome's skating hasn't gotten better magically overnight, but the Blackhawks have showed no concern playing him with other top forwards like Patrick Kane and Alex DeBrincat and he has looked like he belongs so far. On Sunday night, Strome was on the ice with Patrick Kane and Jonathan Toews when he netted what would go on to be the game-winning goal with the two superstars both registering assists on the play. It was Strome's seventh goal since joining the Blackhawks and he's had 14 points now for them in 20 games. However, bottom-line productivity (which can be misleading in small sample sizes) isn't the only reason that Strome is starting to look like he could work his way into Chicago's plans for the future. This year, Strome has now played exactly as many games for the Blackhawks as he did for the Coyotes. In those 20 games his Corsi (shots of any kind) and Fenwick (unblocked shots) numbers are nearly identical. However, the [quality of those shots](http://naturalstattrick.com/playerreport.php?fromseason=20182019&thruseason=20182019&playerid=8478440&sit=pp&stype=2) has improved dramatically with the Blackhawks. Strome took 68 shots (52 unblocked) with the Coyotes and has now taken 66 shots (52 unblocked) with the Blackhawks. However, in Chicago he's generated 44 scoring chances against 35 scoring chances when he was in Arizona. Even more important, Strome is generating high-danger scoring chances at a much higher rate. Strome has created 25 high-danger scoring chances with the Blackhawks after generating just 13 of those chances in his 20 games with the Coyotes. Because of that ability to get into high-value areas of the ice and generate chances, the Blackhawks are rewarding him with more and more playing time. He's now averaging over 17 minutes of ice time a night and played over 19 minutes in the 5-3 win over the Penguins on Sunday. Generally speaking, the Blackhawks are playing better hockey lately but they're still so far behind in the Western Conference playoff race that the results are largely meaningless. But not for players like Strome. The front office would love to storm back into contention with a crazy run and that's still technically possible, but the more reasonable goal in lieu of that is for them to use the coming months to help inform important roster decisions moving forward. With Strome, there's no real sense of urgency. He's under contract [through next season](https://www.capfriendly.com/players/dylan-strome) and then he's a restricted free agent after that. So they've got control of the situation. Still, the sooner they feel comfortable with him and where he belongs in their forward mix, the easier it becomes to start putting the pieces back together as they rebuild. Strome is playing well right now and it's victories like that with younger players that Blackhawks fans should be looking for right now.